(Tuesday, February 12, 2019) Tuscarawas County, Ohio – The Tuscarawas Valley and much of the surrounding area is under a flood watch as precipitation continues into the evening. According to the Army Corps Engineers, Tuscarawas County has already received an inch and a quarter of rain. 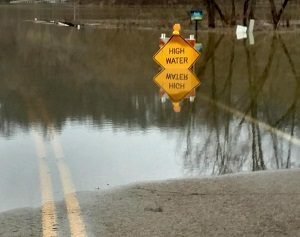 Tuscarawas County Emergency Management Agency Director Alex McCarthy says that currently, the biggest impact is along State Route 800, where water has exceeded a ditch onto the roadway. With a flood watch in effect until February 13th at 1 p.m., the area is supposed to get an additional one and a half inches of precipitation.